This tech stock is stuck in a downtrend as the broad market rebounds. After flying high in 2017 and the first half of last year, shares of Micron Technology Inc. (MU - Get Report) have been having a rough run more recently. Since peaking last summer, shares of Micron have almost been cut in half, making the tech stock another victim of the rotation from the technology sector's being a leader to a laggard in the rocky second half of last year. Now, as stocks rebound in early 2019, plenty of investors are wondering if now's finally the time to get back into some of the momentum tech names that corrected the hardest in recent months. For Micron, the answer is "not yet." The stock closed up 1.09% at $34.24. 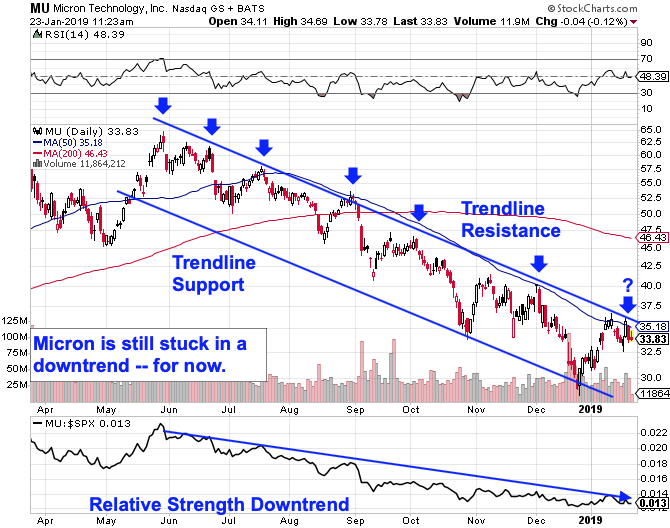 It doesn't take a technical trading whiz to figure out Micron's price trajectory right now. Since last summer, shares have been trading lower in an extremely well-defined downtrending channel, a range that's corralled shares without fail since the end of May. Simply put, every test of trendline resistance at the top of that price channel has been met with additional selling pressure, swatting shares lower. So, as Micron tests resistance for the seventh time in as many months, buyers should be concerned about the glut of overhead supply of shares that we've seen consistently. Likewise, relative strength continues to trend lower as well in 2019. Relative strength measures a stock's price action vs. that of the broader market; the fact that Micron's relative strength is making a series of lower swing highs signals that shares continue as a comparatively worse place to be than the S&P 500. That's not to say that Micron is a lost cause forever. But it does make sense to steer clear as long as the downtrend remains intact. The 50-day moving average has been a solid proxy for resistance since the middle of last summer - that makes it a logical place to watch in 2019. If Micron can push materially above its 50-day, buyers are gaining traction and the downtrend could finally be coming to an end. We're not there yet, however. This stock may look tempting, but investors looking for an opportunity to pick up shares of Micron following a 46% haircut should steer clear for now.